Here we have made a selection for you. Consisting of 2 double, 2 show and 5 alpine and varieties. 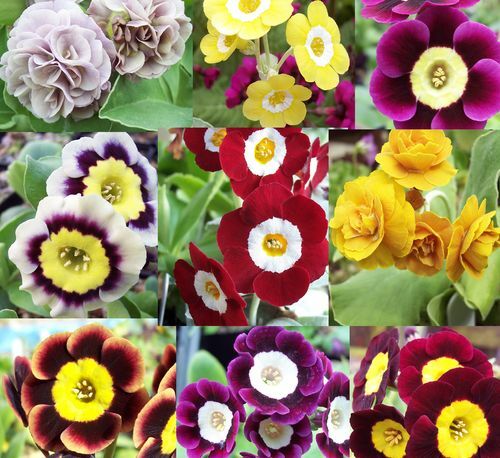 The varieties we will choose are named and have similar colour to those illustrated. This makes a great birthday gift for a close friend or relative. Plants supplied bare root and are of flowering size. AND PRICE. VERY WELL PACKED. Prompt despatch & arrived in Yorkshire in 2 days with reasonable postage charge. Plants in great condition - surprised at their maturity - strong & healthy with large root systems. I have often been disappointed with more well known suppliers. Will definitely use Peninsula Primulas again.